Here at Gamka, we have become experts at doing trench roller repairs. It seems that most of our competitors do not want to tackle this tough and challenging task. They are complicated and time consuming, so this is probably why they shy away from attempting to fix them. We do not shy away from a challenge. Our service department tackles these repairs on a regular basis as needed. We also have them throughout our rental fleet. We perform all repairs, maintenance and warranty work on these machines in-house. 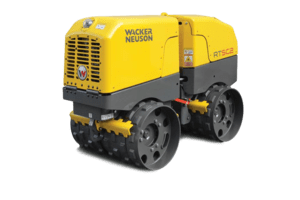 We offer replacement drums, hydraulic pumps, pump seal kits, motors, remote control transmitters, transmitter batteries, machine batteries, oil filters, air filters, hydraulic filters, replacement hoses, rebuild kits, control panels, voltage regulators, receiving eyes, sensors and other replacement parts for Wacker trench rollers. Gamka Sales Service Department will test your remote control box to diagnose what issue exists. Please provide as much information with the unit as to what you feel is working and not working. Prior to any work being performed, you will be contacted with an estimate of the cost. Upon your approval, we repair the unit and send it back to you in a couple days, If the estimate is not approved, there will still be a diagnostic and estimating fee that is due. Please ship your controllers to us, packing them really well for protection so it will arrive securely. Please include contact information in the package. Wacker infrared remote control transmitters for trench rollers – We fix them to. We will need your serial # to identify the correct transmitter for your machine. We can repair or replace your current remote. We also fix other brands of trench rollers, like Rammax, Dynapac, Atlas Copco, Stone, Multiquip, Bomag, etc. Please make sure you have Year, Make, Model #, Serial # when asking for parts or dropping it off. Make sure you company name is clearly on the machine or we will tag it. Please make sure you provide a detail list of problems you are experiencing with the machine when you drop it off. The worst thing you can do is have a driver drop it off and say “I am dropping it off, but I do not know why” We then have to spend extra time looking for what is not working. We will bill for all labor including diagnosing problems. Save money by providing more information. We are experts on trench roller repairs and warranty work. Contact us today at 732-248-1400.